Do you want to support your friends or loved-ones and pass on your wishes for good fortune, peace and calm in a hectic life? Let us send this special and symbolic handcrafted necklace on your behalf to show them how much you care. The oft-touted calming qualities of Sodalite (said to help with life's stresses and strains), combine with the symbolic Indalo man (recognised in Spain as a symbol of safekeeping and good fortune), to make this necklace a truly inspirational present. SODALITE : The so-called “Peace gemstone"
Sodalite is said to be the peace and negotiation gemstone - and a gem for endurance. Sodalite jewellery is characterised by its dark, intense blue colour - sometimes with white or yellow streaks. Some say the gemstone can help change the way you feel about yourself and it is believed to have subtle, soothing energies and help people see the wisdom of adopting a simpler, calmer and less hectic lifestyle. So, a gift of sodalite jewellery could be good for healing rifts in partnerships and relationships, because it is said to help bring calm to arguments or disagreements. Do you know someone who could do with more of a calm and tranquil approach to life's current challenges? 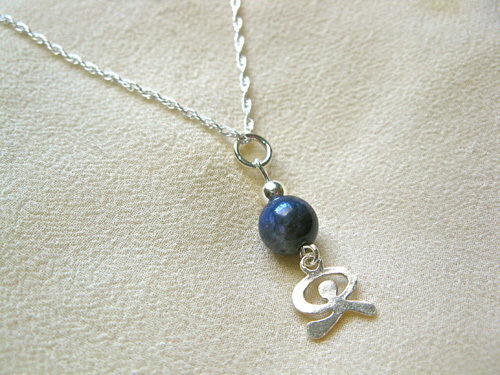 Give them your support with this beautiful Sodalite and Indalo necklace - unique and meaningful. Comes gift-wrapped, like all our presents - and we can print a personal message on your behalf.